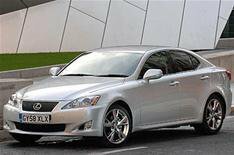 Lexus wins JD Power survey again | What Car? Lexus has won the JD Power satisfaction survey for the 11th year in a row and its IS compact executive is the survey's top rated car. The survey of 16,500 car owners also found that motorists are more satisfied with their vehicles than ever before. However, Vauxhall came bottom of the league table of 28 manufacturers, while the Ford Ka was 108th and last in the table of cars. The Honda Accord family car, Lexus RX 4x4, Honda CR-V and Toyota Prius hybrid rounded out the remaining slots in the top five most satisfying cars to own. Joining the Ka towards the bottom of the list are the Kia Rio (in 107th place), Vauxhall Corsa in 106th and the Suzuki SX4 in 105th. Overall, satisfaction levels averaged 79.4% compared with 78.9% in last year's survey and MPVs in particular have improved more than any other category for product appeal, quality and reliability. What Car? magazine editor Jim Holder said: 'It's great news that people are more satisfied with their cars than ever, and it proves that car makers are getting things right more often.